The Rev. Dr. Jim Antal is Minister and President of the Massachusetts Conference of the United Church of Christ, the largest Protestant denomination in the Commonwealth. A climate activist, he provides national leadership in that area for the United Church of Christ. Ash Wednesday is a day of conscience, repentance and conviction; a day when we take stock of our personal lives – and of our life together on the planet; a day when we confess our self-indulgent appetites, our intemperate love of worldly goods and comforts, and our obsession with consumption of every kind. It is a day of profound, private self-examination, and yet it also includes a public witness – an ashen cross on our forehead to remind ourselves, and the world, who we are and whose we are. On Ash Wednesday, Christians acknowledge that we are accountable to the God who gave us life and who entrusted the earth to our care. That we have not done a good job with that trust is news to no one. In his Second Inaugural Address, President Obama declared, "We, the people, still believe that our obligations as Americans are not just to ourselves, but to all posterity." And he went on to say that our generation must respond "to the threat of climate change, knowing that the failure to do so would betray our children and future generations." Because our generation is facing an unprecedented challenge – a challenge of our own making – repentance is essential if we are to find a way forward. Ash Wednesday is a good day to be arrested because civil disobedience is a form of repentance. It was repentance of the sin of slavery that prompted Henry David Thoreau to lay out the principles of civil disobedience in the mid-nineteenth century. One hundred years later, the Rev. Dr. Martin Luther King, Jr. and hundreds of others engaged in nonviolent civil disobedience to prompt this nation to repent of the sin of racism and segregation. Our generation must now repent of the sin of wrecking God’s creation. Our decades of science denial have now been exchanged for widespread recognition of the community-crushing effects of climate disruption, whether by way of wildfires, droughts, or superstorms. These are the conditions in which the conscience of a nation can be born. Today I will be arrested at the gates of the White House along with 40 or so environmental leaders from all over the country. Ash Wednesday – a day of conscience, repentance and conviction – a good day to be arrested. By our actions, we challenge President Obama to match rhetoric with reality. Last night, in his State of the Union address, President Obama declared, “But if Congress won’t act soon to protect future generations, I will. I will direct my Cabinet to come up with executive actions we can take, now and in the future, to reduce pollution, prepare our communities for the consequences of climate change, and speed the transition to more sustainable sources of energy.” Stopping the Keystone XL pipeline is one such action. 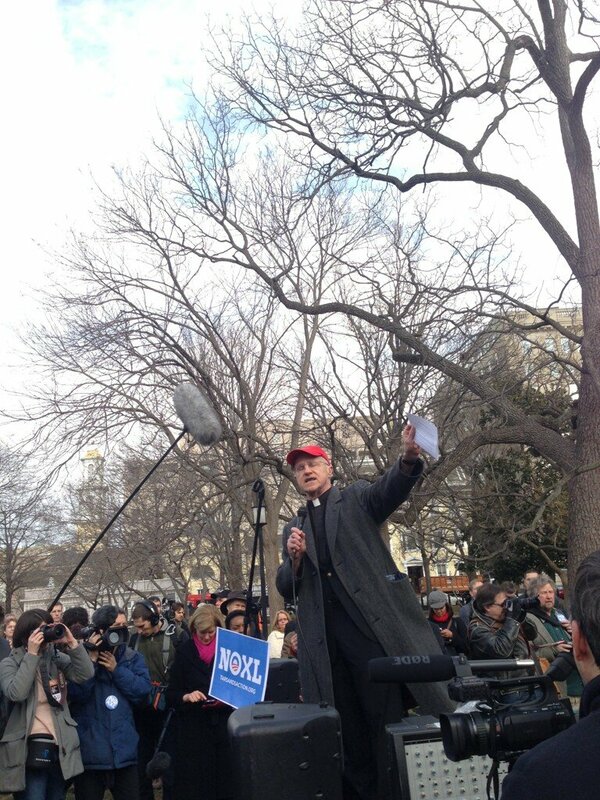 On Sunday, February 17, 2013 our national conscience will come to life. Buses from Nebraska, Wisconsin, Texas, and dozens of other states will bring citizens willing to stand up, shout out, and rededicate their time and energy to remind the nation of our obligation to God’s creation and future generations. This is an historic moment that demands of us the courage of our convictions. In August 2011, President Obama learned of our convictions when 1253 people were arrested in front of the White House, and he shocked the fossil fuel industry by temporarily halting the Keystone XL pipeline. Now the people will again show our conviction, so that President Obama can again demonstrate his own. He alone can stop the construction of the Keystone XL pipeline. If he bows to the short term interests of the fossil fuel industry, millions of barrels of the most-polluting oil on Earth from Canada's tar sands will be pumped to the Gulf Coast of the U.S. – and it will be virtually impossible to stop climate disruption from spinning out of control and, in the President’s words, we will betray future generations. Civil disobedience may not be for everyone. But going to jail – giving up one’s freedom – to sound the alarm that we – all of us – are doing something wrong, and we must change… that conviction is becoming more and more widespread. Ash Wednesday is a good day to be arrested. And every day is a great day to act on our conviction that God has called us to stand up for the good creation God has entrusted to our keeping.